You may think that feeding your dog little treats and scrap food from the table while you cook is no big deal, but it can be quite substantial. If you are feeding your dog a piece of a carrot or a sliver of shredded cheese then that may not be as much of a concern. But the truth is most people aren’t paying much attention to the scraps or pieces of food that they are tossing to their dog while they’re cooking or eating. 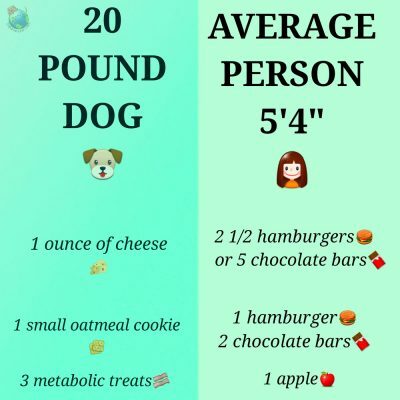 These little snacks or what seems like small pieces of food, can actually have a huge affect on your dog and the amount of food they’re collectively consuming. In fact, it can lead to a whole series of medical conditions. 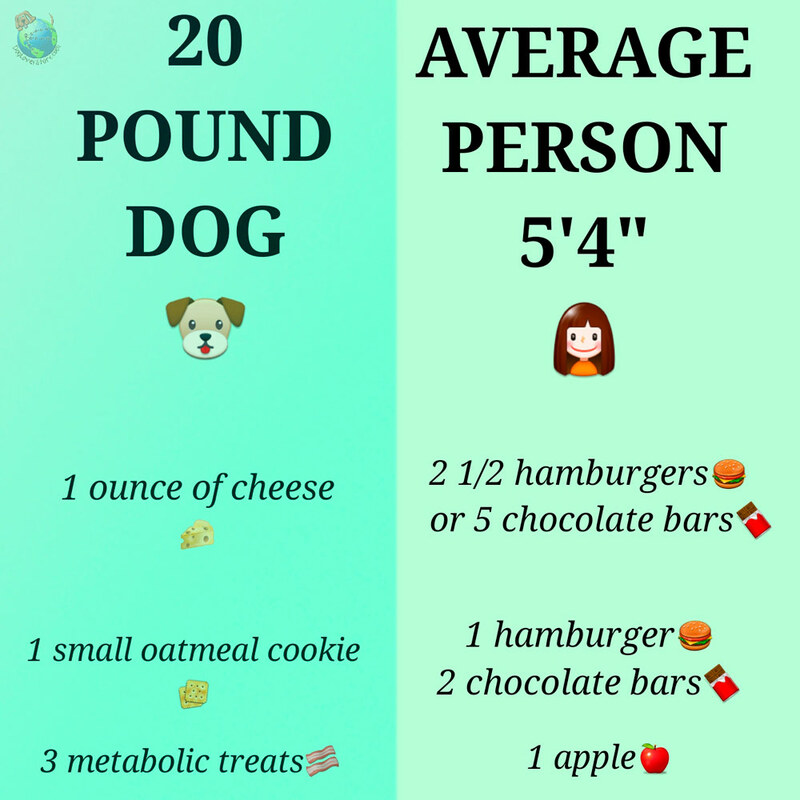 For example, if you give your dog 1 oz (~28g – a standard serving of cheese in the US) of cheese, it is like feeding an average human two and a half hamburgers! Or even worse it is like feeding the average human five chocolate candy bars. Now, when we say average human we are referring to a woman of average height at about 5 ft 4 inches, who consumes about 2,000 calories per day*. If a woman was consuming two and a half hamburgers or 5 chocolate candy bars in one sitting, that would definitely have an affect on their diet. In this example, we are referring to a 20lb. dog. Now imagine if you fed your dog one ounce of cheese every night while you are cooking dinner. That would be like the average person eating 5 candy bars every single day or eating hamburgers every single night. This is certainly not healthy. Let’s say you accidentally drop a cookie on the ground and your dog eats it. That would be the human equivalent of eating two chocolate candy bars just in a couple bites. Again, not healthy! What seems to be little snacks can actually be huge snacks when it comes to your dog’s diet. Remember, humans are not the only ones who face health concerns when they are overweight. Dogs, just like humans, get medically diagnosed all the time. According to the Mayo Clinic, dogs are diagnosed with metabolic syndrome when they are experiencing conditions such as “high cholesterol, high blood sugar and high blood pressure, as well as excess body fat.” Unfortunately, when a dog is diagnosed with metabolic syndrome they’re often put on a strict diet as well as an exercise plan. In general it is important for your dog to eat healthy food and get in their daily exercise, but you don’t want it to become a medical life or death necessity. If you were to feed your dog 3 metabolic treats then that would be like a human consuming an apple. Now this seems like a much healthier comparison. A metabolic treat is a treat for a dog that is low in processed ingredients and high in healthy fats, veggies, and proteins. 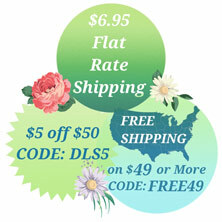 Metabolic treats are ideal for dogs who either need to maintain their weight or lose weight. We know how important it is for you to reward your dog’s good behavior with treats or say goodbye to them with a treat before you leave the house. So if your dog needs to lose weight or is at risk of being overweight, then metabolic treats may be ideal for your dog. When trying new foods or any sort of supplement or complementary foods, consult your vet. *average human guidelines and food comparisons were sourced from online images with unknown origins.